Google bought BumpTop, an interesting software that replaces your computer's desktop with an intuitive 3D environment where you can quickly organize your files. BumpTop is a fresh, innovative 3D desktop user interface that lets you stay organized and share your files and photos from your desktop naturally and easily. BumpTop has the look and feel of a real desktop, so it's natural and intuitive. But unlike a real desk where stacks can become unruly, BumpTop lets you pile files intelligently -- by project, by file type or any way you choose. People organize their real-world desks in any number of different ways, to suit their own style. Research shows that everyone stacks and piles their documents, and almost a third of people indicate stacking and piling is their preferred way of organizing their desks. 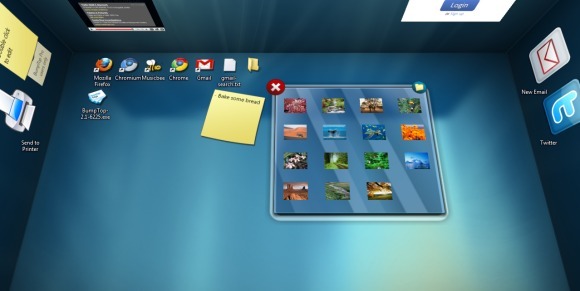 However, people have had to conform to the rigid, conventional desktop organization which is grid and folder based. BumpTop allows users to create a digital desktop that is intuitive and easy to use, just like their physical one but with the power and intelligence of the underlying computer to increase productivity in a fun and playful way. You can still download BumpTop for Windows and Mac until the end of the week. The application doesn't use a lot of resources and it completely replaces your desktop. Even if it doesn't support multi-touch or Linux, BumpTop seems like the perfect addition to Android. Can I uninstall BumpTop 3D to get the older desktop? Android? I thought it might fit in ChromeOS as well. I agree this could be a very cool feature addition for Android. One of the problems I have on my DROID screens is organizing my widgets and applications. This looks like it could be a great way to make the very valuable screen real estate more manageable. Very excellent i like it..
can i get it for ubuntu linux. is there any version available for Linux. What was the deal's amount? Disclosed? The real question is WHY has Google bought BumpTop? Will they choose to integrate it in the Chrome OS/ will they use the technique for Android, their web features considering the host of services which Google provides online as of today like Gmail, Google Calendar, Google Reader..... I guess the application of BumTop and Google's plan behind this purchase would be revealed only when the time is right. lassoo?? las-sue??? who says that? is there any way to download this application now that google has bought it? i doubt theyll continue it.. I also would like to find out where to get the Bump Top Desktop. Im need download Linux version, PLS. I enjoy the program, but keep running into a problem. I'm not a pc whiz so why does my BumpTop freeze every time I come back to it? How can I fix this?